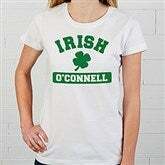 Whether wearing to the St. Patrick's Day Parade, St. Patrick's Day Party, to an Irish Pub, or any day of the year, our Irish Pride Personalized Apparel reflects their sense of style! 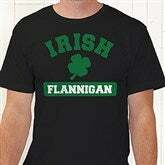 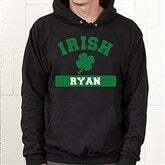 Our exclusive design features "IRISH" boldly printed across the top in an emerald green athletic font. 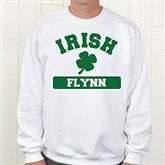 Below the lucky four-leaf clover design, you personalize it with their first name, last name or nickname, calling it theirs alone!